I don’t joke with my food – not breakfast, lunch or dinner. I have a fondness for breakfast for it sets me up for the rest of the day. Especially at the weekend when I can mess about and cook all sorts. 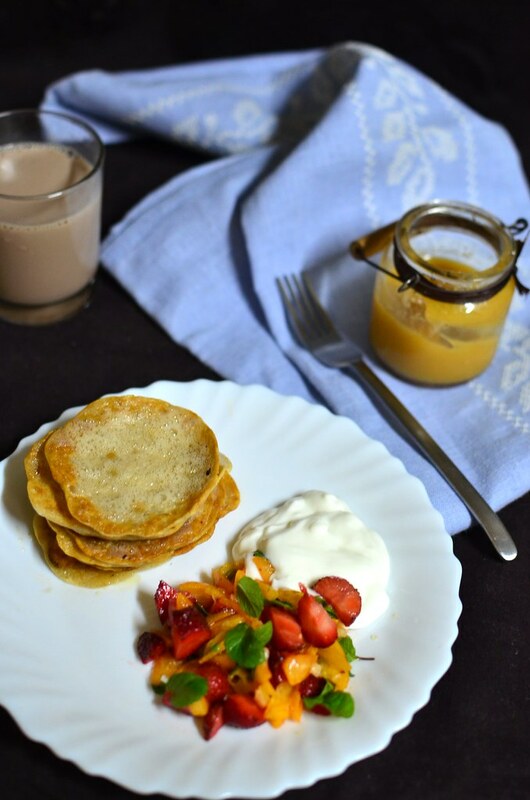 Here are a few quick and easy recipes, for hectic week mornings and leisurely weekend feasts – quick, easy and delicious. In Part 1, I share a few of my favourites which are largely carb-based. In Part 2, I’ll share my fruit-heavy breakfasts. Stay tuned :). Tip: Add fruits and nuts, yogurt or other dairy for substance. Tip: soak oats ahead of time, for raw and cooked versions to cut down on prep time. It keeps well, refrigerated. I’m a big fan of heart-healthy oat. I like oats all sorts, from quick cook to pinhead oats. I have the oats both raw and cooked, depending on what I’m after. When I want rich and creamy, I go for raw; when I want warming and nourishing, I cook. Combine raw oats, milk and dried/ fresh fruit with a pinch of spice. One of my favourites is raw oats, milk, chopped apple and cardamon/cinnamon powder. This method combines raw oats with milk, and other additions and refrigerates for a period, often overnight. It produces a rich, creamy cereal, so much so I tend to use skimmed milk as a result of the inherent creaminess of oats. And you can have a chocolate version too :-). 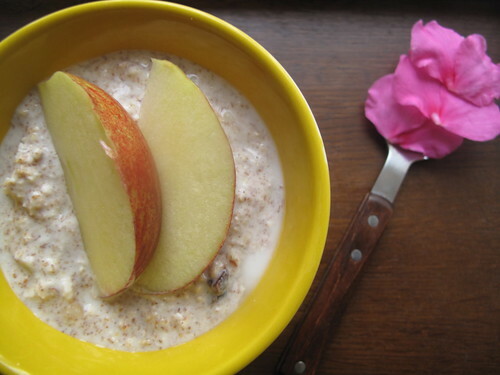 I love Swiss Bircher too – a variation which combines oats with nuts dried fruit, fresh grated apples, milk and yogurt to produce one of my favourite ever breakfasts. And a gluten-free version is possible. Often, I have my oatmeal the regular way – soaked briefly in water or milk then cooked till a thick cereal forms. The addition of apple sauce or pumpkin puree, with warming spices – cinnamon, ginger, cardamom, cloves make a lovely bowl. Fresh and dried fruit work well too – both cooked and raw. A dollop of nut butters and other spreads is heavenly. Go on, add some peanut butter, or nutella or Speculoos paste to transform your bowl. 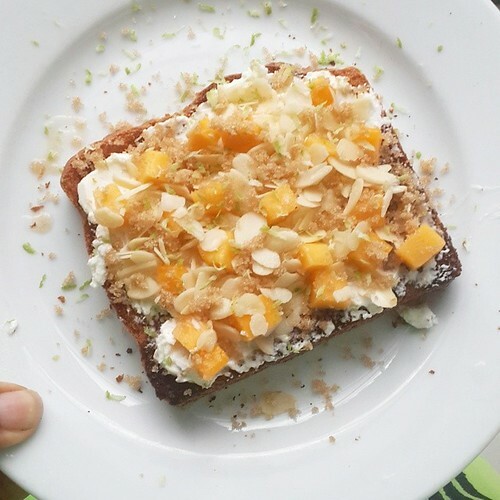 Toasted, with seeds, fresh and dried fruits and nuts. One of my favourite ways to have oats. My children love it uncooked, and I absolutely heart it warm and nutty. The beautiful thing is you can do all the toasting ahead, and then cook portions as you like. For best results, I like to keep the toasted mix frozen. A beautiful and easy to accomplish combination. Add a layer of fruit, preferably sauteed, like pears or apples. This version combined sauteed apples, topped with oatmeal and sugar, and set under a hot grill to brulee is the ‘ish. Take stale bread, milk, and eggs and you have a winner. French Toast. Fry in brown butter, coconut oil. Form a crust with cornflakes and nuts, or some lemon zest and cinnamon or ‘Bruleed’, with fruit and almonds. 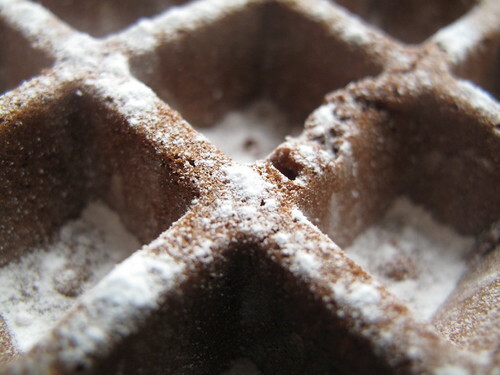 Make pancake/ waffle batter ahead of time and refrigerate for 3 – 4 days. Very often, I use a combination of flours and oats in making up my pancake mix. I start off with all-purpose flour and sub a third or so with other flours. For me, I’m thinking a few things – upping the fibre and affecting the texture. 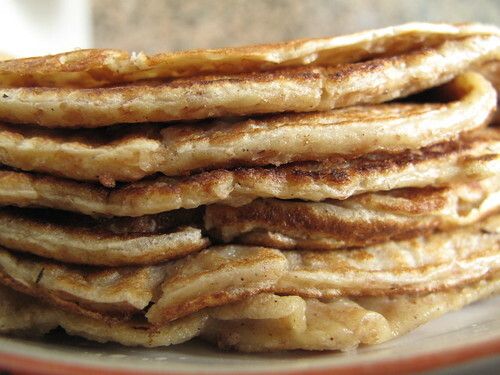 Oats generally make the pancakes softer but slightly heavier. Sweet, and enjoy your pancakes plain, with lemon, and sugar, with bananas and chocolate sauce. However you want really. With yogurt, creme fraiche, with sausages and bacon, with a fruit salad, or with every single one of them. 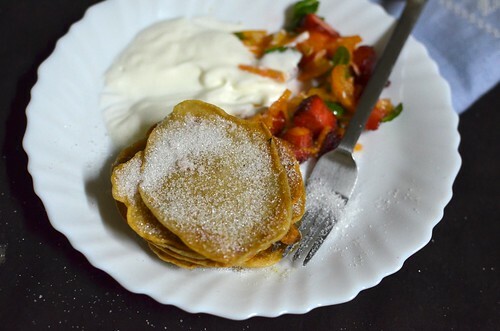 Various versions exist, from poffertjes to drop scones, all delicious. BTW, this is my winning breakfast/brunch for when I have a full house – the pancakes are easy to make, especially as I use 2 frying pans to half the cooking time. The beauty I think is in the ‘buffet’ style I like to serve it – bowls of fruit, all sorts and other toppings from chocolate chips to nuts. A firm favourite. Savoury, and this is an easy one. Add herbs and spices to the batter. 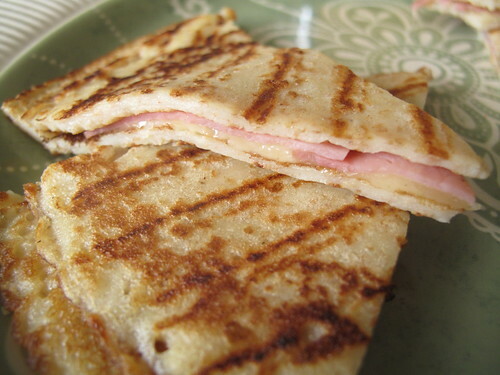 Make a quesadilla by filling two pancakes with cheese and ham, then warming in a pan till the cheese is melted and stretchy. One of the most divine things ever. I tend to make a slightly thicker version of pancake batter for waffles. And my children love them, so I go all out transforming them to chcoolate waffles, and red velvet ones and pumpkin puree and potato ones. 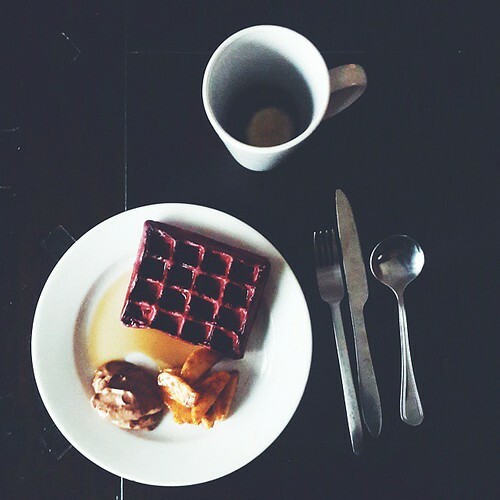 So yes, both sweet and savoury, waffles are easy to rustle up. All you need is an iron, and some fruit, cream and syrup to serve. Part 2 coming up = on fruit bowls and more.